In A Duty to Resist: When Disobedience Should Be Uncivil, Candice Delmas aims to foster understanding of resistance to injustice as a capacious concept that can include the possibility of lawful dissent, principled disobedience and revolution. This is a provocative and rewarding contribution to the literature, writes Suzanne Smith, that is particularly valuable for its attention to the question of the situational conditions of obligatory, potentially uncivil resistance. A Duty to Resist: When Disobedience Should Be Uncivil. Candice Delmas. Oxford University Press. 2018. ‘A commonly heard complaint’, remarked Alexis de Tocqueville in his analysis of events leading up to 1789, ‘is that the French have no respect for law’. To his mind, given the corruption characteristic of the Ancien Régime, this was not surprising. He blamed this lack of respect on the deficit of ‘intermediary powers’ capable of integrating the concerns of ‘private individuals’ with the policies of the state. Yet what Tocqueville wrote with respect to attitudes concerning law in pre-Revolutionary France is sometimes also said of the post-1945 Republic, when intermediary powers were quite robust. No sooner did World War II end than did resistance – often violent – arise against dirigisme économique. At the time, theoretical justifications for violent protest abounded in French thought. To Maurice Merleau-Ponty, writing in 1947, the liberal notion of ‘respect for law’ was merely a means of disguising the reality of economic and political violence, for example, by ‘justify[ing] police suppression of strikes in America’. Regarding ‘respect for law’, America has arguably become more like France since 1945, both in practice and theory. In recent years, theorists and historians, such as Jason Brennan and Jennet Kirkpatrick, have called attention to uncivil, violent protest in the American past and its present. For Brennan, uncivil disobedience is not only defensible but even obligatory. Any number of current modes of protest and resistance in the post-2016 American landscape are openly violent and uncivil. Yet changes in scholarship and practice aside, the relative paucity of theoretical justifications for uncivil disobedience suggests the heavy – indeed, arguably the unique – normative weight that ‘civil disobedience’ holds in the American popular and theoretical consciousness. 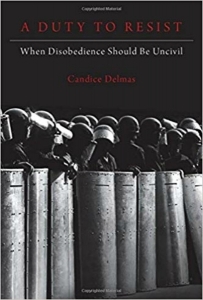 In philosopher Candice Delmas’s fine new book, The Duty to Resist: When Disobedience Should Be Uncivil, she aims to foster understanding of resistance to injustice that looks beyond compliance with any given national, normative-procedural complex as its defining horizon, and seeks to generate ‘a capacious concept of resistance encompassing lawful dissent, principled disobedience and, at the limit, revolution’. With her first book, Delmas, Assistant Professor of Philosophy at Northeastern University, has provided a consistently provocative and rewarding contribution to the literature on resistance, moral duty and political obligation. This fair-minded and wide-ranging work is especially valuable for its attention to the question of the temporal, situational conditions of obligatory, potentially uncivil resistance. For Delmas, the duty to resist pertains to ‘everyone’, but in different ways at different times. public understanding of civil disobedience is the product of two different strands: the broadly Rawlsian philosophical conception of civil disobedience and the official narrative of the civil rights movement in the United States. I am not aware of any comparative research on people’s understandings of civil disobedience, but one might reasonably expect many similarities with the American conception, itself inspired in important ways by experiences abroad. The central figures in this ‘public understanding’, as Delmas sees it, are Henry David Thoreau, Martin Luther King, Jr. and Mahatma Gandhi; as Delmas remarks, these are the ‘names uttered […] whenever debates over principled lawbreaking arise’. Yet she argues correctly that, in fact, ‘neither their ideas nor their actions fit the standard conception of civil disobedience that philosophers – Rawls chief among them – began to articulate in response to the American civil rights movement’. This book takes as its problem the notion that this ‘standard conception’ fosters uncritical deference to norms of respect for law. Because Delmas neither takes the legitimacy of ‘large, industrialized, liberal democratic Western nation-states’ for granted or disputes it, she is free to think about disobedience in terms that are abstracted from questions about the varying notions of legitimacy characteristic of particular nation states, opting instead for an account of political obligation for ‘all societies, legitimate and illegitimate’. Delmas’s attempt to move beyond the Rawlsian horizon of near justice as it figures in a ‘reasonably just’ democratic constitutional republic is made trickier by the fact that she argues that ‘the very grounds supporting a duty to obey also impose a duty to disobey under conditions of injustice’. Such is the plasticity of her project that she claims that ‘my account could be seen as either an alternative to or an extension of defenses of duty to obey the law’. To the extent that the project should be read as an alternative, it is meant to serve as ‘a radical alternative to philosophical anarchism’. Initially drawing from the example of the Freedom Riders of the American civil rights movement, Delmas asks if the responsibility for protesting injustice that they assumed is obligatory. She argues that they are obligatory on the grounds of ‘the natural duty of justice […] the principle of fairness […] the Samaritan duty […] and political association’. First, she defends the idea that there is a natural duty to resist injustice. In her terms, this duty is natural because ‘it is grounded in our nature as moral beings and binds us all equally, regardless of our relations or voluntary undertakings’. Delmas does a good job of defining what sorts of injustice trigger the duty to resist. She uses ‘disrespect’ to categorise wrongs that violate norms of equal status among citizens, and usefully comes up with the category of ‘wrongs to nonmembers’ to categorize wrongs to noncitizens. She cites as well ‘deliberative inertia’ and, finally, ‘official misconduct’ and ‘public ignorance’. Supplementing the core ‘obligation to resist oppression’ is the principle of fairness, which comes into play in the context of our obligation to resist ‘exploitative and harmful schemes’. Fairness should beget solidarity with those affected by such schemes, and issue forth in collective action, while Samaritanism can give us insight regarding how to help people who need to be rescued. The most important of Delmas’s accounts of the sources of the duty to resist pertains to associative obligations, which ‘diffe[r] according to one’s role relative to others’. Delmas takes the obligation of political membership and the obligation to defend human dignity together to support ‘a general obligation to resist one’s and other’s violations of dignity’. Resistance to violations of dignity may be violent and uncivil: ‘those who shoulder the burdens of oppression cannot be reasonably expected to satisfy the demands of civility’. Here, normative expectations apply not universally, but relative to circumstance and experience. So too do normative responsibilities. Delmas does not want all people deciding for themselves what the duty of justice requires, and she believes that the well-informed have different responsibilities to those who are not. Delmas shows an impressive degree of subtlety, empathy, skill and range in attending to moral and political issues. Her treatment of the imperative of supporting undocumented people is especially compelling. She shows similar strengths in articulating selected Rawlsian-related theoretical claims and adding to them in nuanced ways. Yet when it comes to historical actors and action, she tends to generalise, for example, with reference to the ‘political obligation’ driving the Freedom Riders. She fails to grapple fully with what the actors involved, such as John Lewis, Freedom Rider turned elder statesman, have said about their underlying religious motivations. One wonders what is gained by reading the Rawlsian notion of civil disobedience more as a response to history than as a dependent branch of his theory of justice. With respect to contemporary hearts and minds, one also wonders if more Americans are committed to a view of civil disobedience in which obligations to state law are superseded by religious obligations to a ‘higher law’ than they are to a Rawlsian conception of duty. Delmas’s impressive purchase of scope and generality occasionally occurs at the expense of careful attention to questions about political, moral, historical and philosophical difference. For example, she writes that ‘many philosophers – from Socrates to Rawls – believe one’s sole or main political obligation is to obey the law of basically just, legitimate societies’. Yet it is not clear that the Platonic Socrates had a positive concept of ‘political obligation’, much less of ‘basically just, legitimate societies’ as such. He is willing to imagine what the laws are saying to him in the Crito, and thus to listen to and concur with his own words in the fictive mouths of the laws. The Socrates of the Crito refuses to escape from the law’s verdict; but the Socrates of the Apology refuses to submit to the law’s judgment. To the limited extent that we may extract from the dialogues a Socratic position regarding obedience to law, it is more suggestive of ambivalence rather a conclusive judgment. For Socrates, as for Aristotle, the rule of law is an inferior but politically necessary substitute for the rule of the wise. For his part, Rawls states that the moral obligation to obey the law is not a principle unto itself but rather ‘a special case of the prima facie duty of fair play’. Because it is unclear what her theory of justice is, it is hard to tell whether Delmas is talking about a natural duty to resist injustice that is defeasible relative to historical or social circumstance, or a positive duty that follows from a theory of what it means to be moral by virtue of human nature rather than history or society. Ultimately, one takes away from this compelling book questions about whether it makes sense, apart from what Elizabeth Anscombe called ‘a law conception of ethics’, to speak of ‘duty’ and ‘obedience’ at all. The prescriptive import of this book lies not in its unexceptionable counsel concerning law, but rather in its implicit suggestion that we need to reflect upon what burdens we bear or have borne in our time, both as individuals and members of collectivities. We might then have a better idea of what prompts our assent, dissent or, as is often the case in experience, some strange, perhaps unconscious commingling of both, barring indifference. Suzanne Smith is the Director of the Center for Writing and Communicating Ideas at the Graduate School of Arts and Sciences at Harvard University. It’s too easy for elitists to suggest that revolution is acceptable when people come to power who disagree with them – but which poor saps or dupes do they plan to shove at the front of the barricades to stir revolt against new forces they are not keen on? It will not be themselves. They will go nowhere near it all, will they? Another useful review though on this site and look forward to reading the book.